I want to log my Jeep's Engine Control Module (ECM) diagnostic data reliably and inexpensively any time the vehicle is running so I can tune it to pass emissions tests and reduce pollution. To do that, I am using a new Teensy 3.6 microcontroller to first decode the data stream out of the ECM and then store it on a microSD card for later retrieval. My Jeep is running a retrofitted General Motors #1227747 ECM, which is the brains of a mid-80's Throttle Body Injection (TBI) system found on Chevy and GMC trucks. 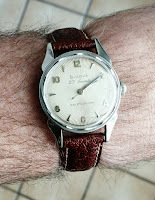 I've been fascinated by mechanical watches since I was a kid. Little machines on the wrist, marking out the passage of time with an unexpected level of accuracy, at least if the watch is in good shape. To measure accuracy and diagnose issues, watchmakers use a watch timer which listens for and measures intervals between ticks. However, the tools are rather expensive for hobbyists, such as yours truly. 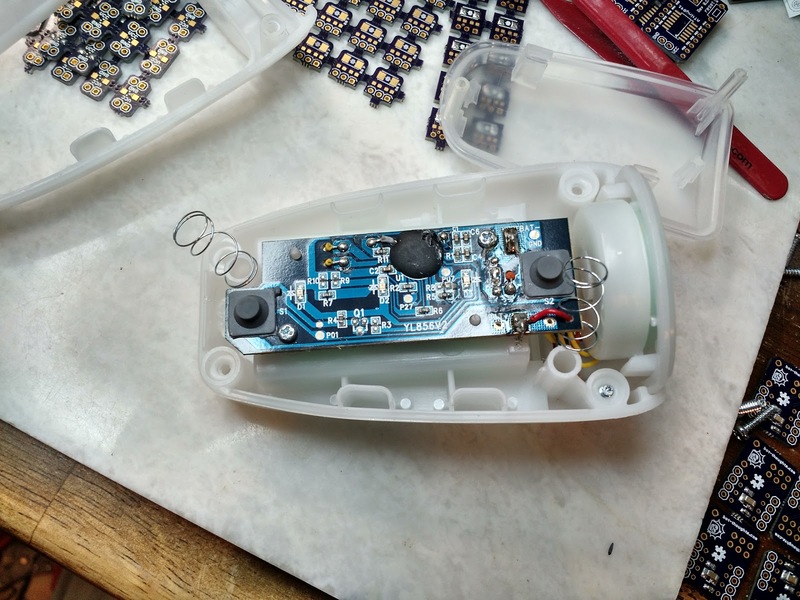 Fortunately, free or low-cost options like Watch-o-Scope ease the burden, but require a sensor and preamplifier. Here's my take on this fun little preamp project. Our little girl goes to sleep easier when we have a Fisher Price Soothe and Glow running. One of them didn't light up, and I fixed it. But not before my wife bought another one. Here's what was wrong. 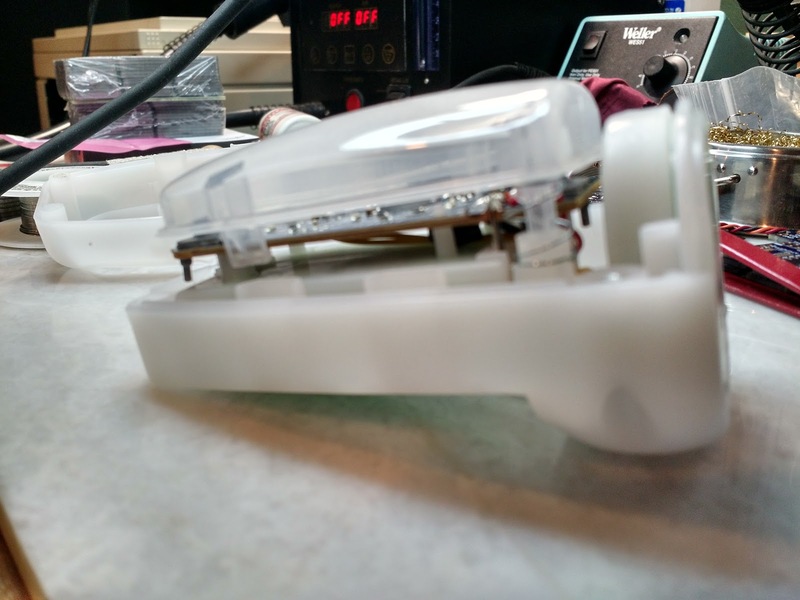 Undo the hook-and-loop closure at the bottom of the animal and pull out the electronics module. It's built in two halves with a giant button on the top. The top half is just a frame around the button. Remove the battery cover retaining screw. Then remove the four screws holding the two halves of the module together. 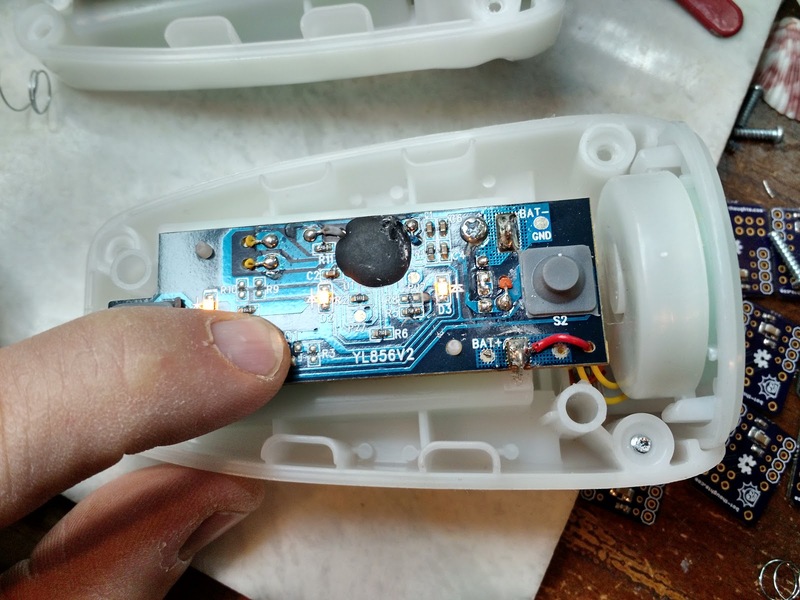 With the top half off, remove the giant button to get access to the PCB. 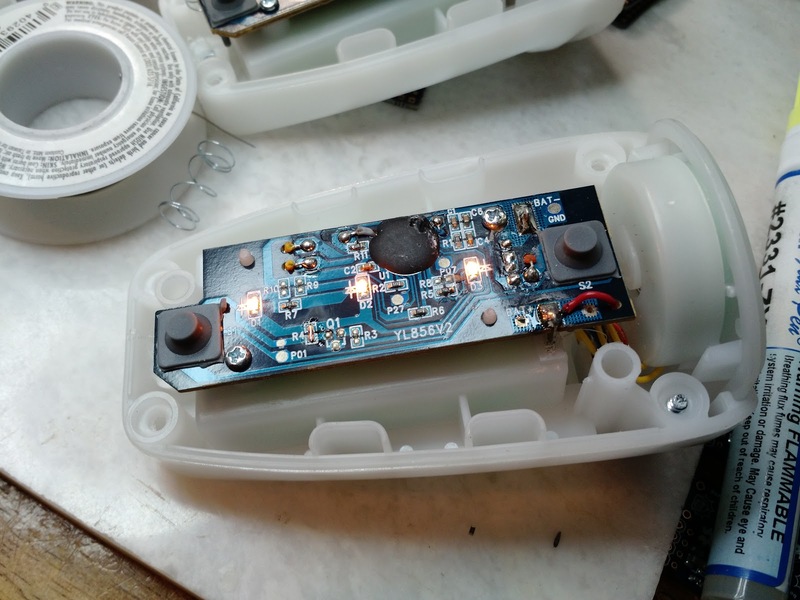 The button has two posts with springs around them and there are two clip ears retaining the giant button to the PCB. Pry one of the clip ears loose and remove the button off of the PCB so you can inspect for problems. 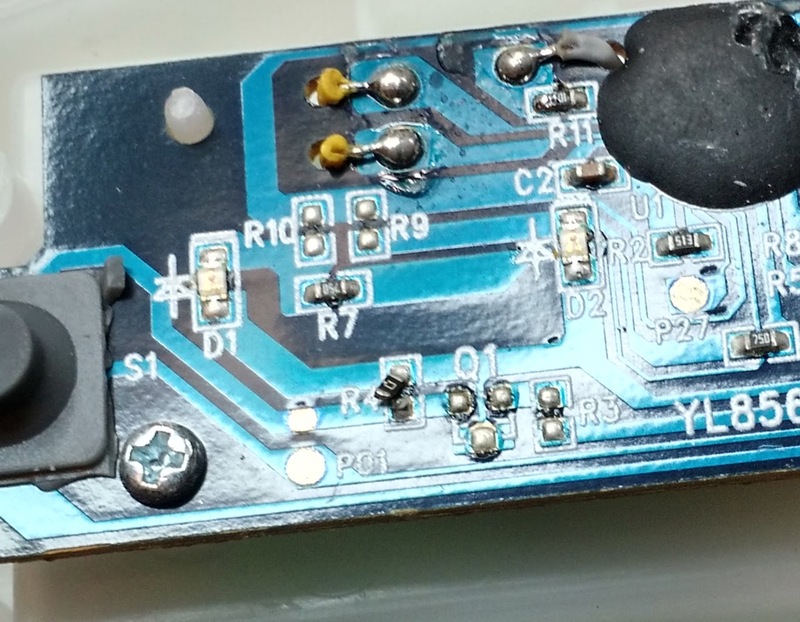 There are three surface mount LEDs on the board. After giving the board a cursory inspection, I thought the problem was simply that the Q1 transistor wasn't populated. But, no; when I disassembled the second, working giraffe it was missing Q1 as well. 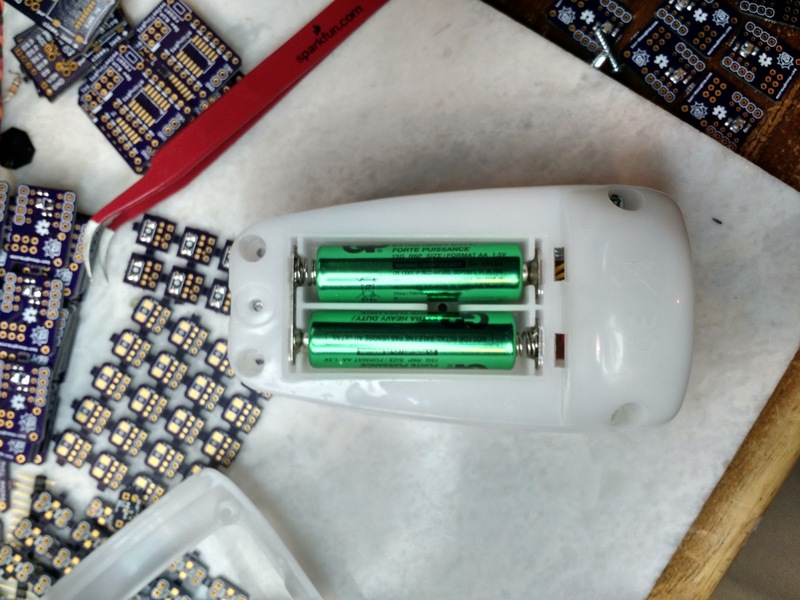 (This is common on production PCBs I've seen, probably parts that testing revealed weren't necessary or features that were trimmed to save cost). 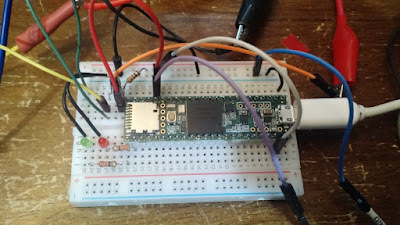 Next, I broke out the DMM to check voltages and noticed the LEDs come on when I tried to measure voltage at R1, the 0-ohm resistor jumper, which transmits power to the LEDs. That's weird. And if I pressed one of the on buttons hard enough the lights would sorta-kinda flicker. Seemed like a bad connection somewhere. I couldn't see anything wrong, though. Then I accidentally discovered that when I touched the 0-ohm resistor with my finger, the LEDs lit up. 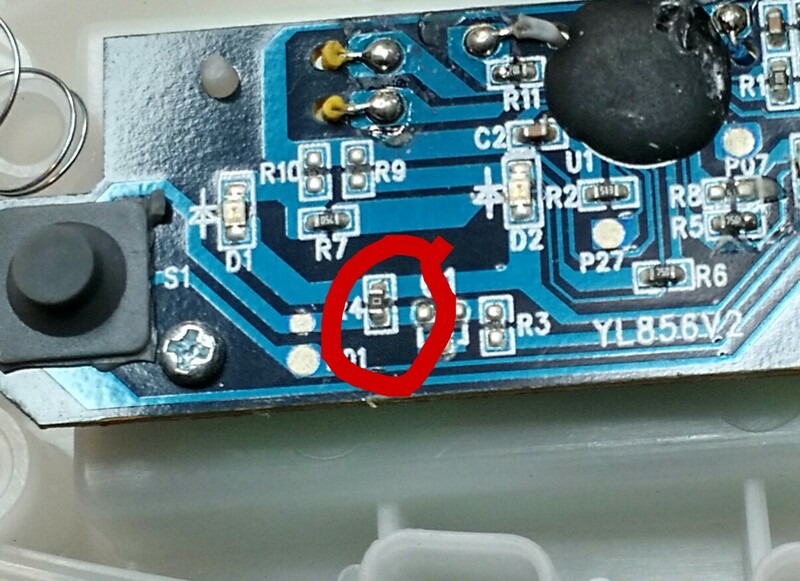 That points to a cracked resistor or cold solder joint. And, in fact, it was a bit of both as the hot air rework station demonstrated. The resistor came loose even though only one of the two joints was molten. And there was a chunk missing. I initially tried replacing the resistor with a 10-ohm, but it dropped too much voltage. So, I replaced the resistor with a small section of bus wire, soldered in with the iron. 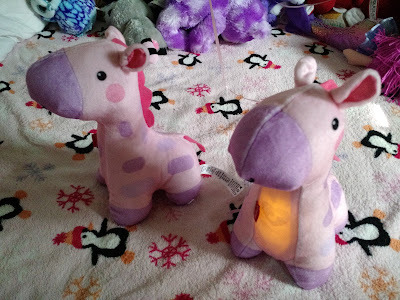 And now the giraffe glows like it's supposed to.